Jennifer Mudge has a slew of New York credits that range from The Philanthropist on Broadway opposite Matthew Broderick to the Witch in Fiasco Theatre’s revelatory Into the Woods off-Broadway. 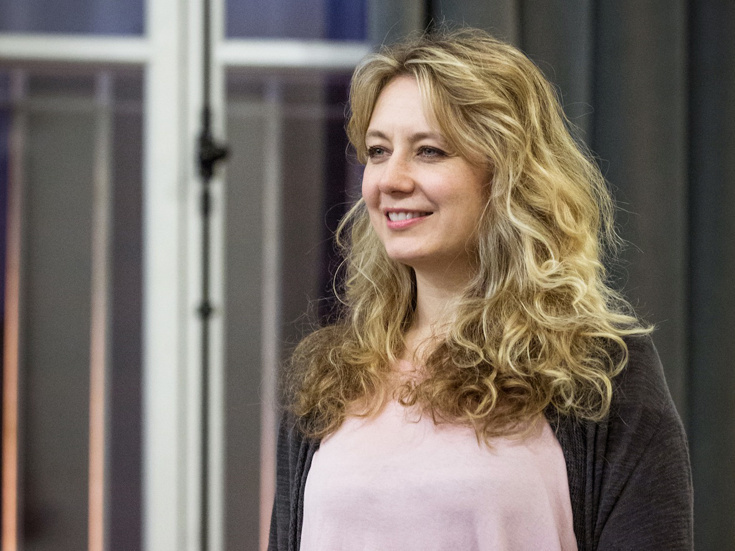 The actress can currently be found making her West End debut at the Playhouse Theatre opposite none other than Friends alum Matthew Perry, who also wrote The End of Longing. Broadway.com chatted with the spirited performer hours before the first preview of this world premiere. Welcome to London! Have you ever been here before? I’ve been exactly one time. I came for a friend’s wedding and kinda hung out and had a good time with my boyfriend, who is now my husband. I thought I’d be back, but I didn’t know it was going to be like this. I did a workshop of the play with Matthew and [director] Lindsay [Posner] in New York in December, and the next day the call came asking whether I would be interested in coming to London. I really didn’t expect that! What were your first thoughts about the venture? I’d seen Lindsay’s work in the U.S. [on productions like The Winslow Boy for Roundabout in 2013] and had liked the performances he got out of people, so was excited when his name came my way. I remember asking, “Is that Matthew Perry the Matthew Perry or some British guy called Matthew Perry?” I just wanted to know when I walked in the room whether I was going to be confronting Chandler Bing. And here he is doubling as the author of the play in which he stars. I know, but what’s interesting is that he sat down to write something and didn’t know it was a play until it ended up that way. He had written a lot of TV stuff with a partner, so he was surprised that this was a play. That wasn’t necessarily his intention. What is it like acting opposite the author? I have worked before with writers who were actors—people like Stephen Belber and Melissa Roth—and in rehearsal they’re like, “Wait, that flows better, use that.” But what’s great about Matthew is that he’s such an obvious comedic force and a great actor himself that when you say things, he totally gets where you’re coming from; he’s very organic in that way. The End of Longing is a four-character play. Tell us about your role. I play Stephanie, an L.A. girl who has fallen into being a high-class prostitute because it’s good money and someone was like, “Do this for a night and make some cash.” Ten years later, it is paying the bills. Matthew plays Jack, the photographer with whom I become involved. The other two actors—Lloyd Owen and Christina Cole—are British but also playing Americans. Was it tricky getting everyone on the same accent page? You know what? These guys can really do it; they sound awesome. I walked in and as soon as they started reading, I wouldn’t have thought to question whether they were really American. But I think more and more actors here move easily between the American and British dialect; it seems as if they can all do it. Were you worried at first about the whole Matthew Perry star thing? I’ve worked before in situations with people who are very high-profile in one way or another and the one thing they have in common—which is true of Matthew—is that he walks into a room and is completely magnetic. He is famous because of that: his presence and confidence and sexiness and he’s obviously super-funny. But he also has been there with us and for us and to work on the play. He saw who I was in my sneakers and dirty hair and still hired me, which meant that I got to be myself. Were you a fan of Friends? Oh God, yes, like from teenage-hood! David Schwimmer directed a Stephen Belber play that is one of the only plays I ever did a workshop of that then went right into production. He’s a really great friend and a very good big brother, and I count myself lucky to now have him and Matthew both in my life. What about London? I see from your tweets that you’re enjoying the food. I love those English breakfasts and could eat them every day, except they’d have to change my character to a prostitute who likes really big Polish women. Seriously, I love the food here and have been eating a lot. Sounds like a love affair meant to last. Let’s just say that if my husband and cats were here, I might be tempted to stick around. I mean New York, I love you but I need a little break; it’s been a little overbearing. I don’t think I’d been out of New York for more than five days in a very long while, so this is nice for that reason as well.